The editors of the KSLR EU Law Blog are pleased to announce a recent publication in the field of EU law with a special discount for the readers of our blog. In recent years the European Union has developed a comprehensive strategy to conclude free trade agreements which includes not only prominent trade partners such as Canada, the United States and Japan but also numerous developing countries. 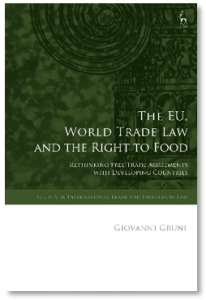 This book looks at the existing WTO law and at the new EU free trade agreements with the Caribbean and sub-Saharan Africa through the lens of the human right to adequate food. It shows how the clauses on the import and export of food included in recent free trade agreements limit the capacity of these countries to implement food security policies and to respect their human rights obligations. This outcome appears to be at odds with international human rights law and dismissive of existing human rights references in EU-founding treaties as well as in treaties between the EU and developing states. Yet, the book argues against the conception in human rights literature that there is an inflexible agenda encoded in world trade law which is fundamentally conflictual with non-economic interests. The book puts forward the idea that the European Union is perfectly placed to develop a narrative of globalisation considering other areas of public international law when negotiating trade agreements and argues that the EU does have the competences and influence to uphold a role of international leadership in designing a sustainable global trading system. Will the EU be ambitious enough? A timely contribution to the growing academic literature on the relation between world trade law and international human rights law, this book imagines a central role for the EU in reconciling these two areas of international law. Giovanni Gruni is an Assistant Professor in World Trade Law and European Union Law at the University of Leiden. Order online at www.hartpublishing.co.uk – use the code CV7 at the checkout to get 20% off your order! Previous postChallenging Harmonisation and Uniformity in EU asylum law: A Broader Problem of International Law?